Hot Melt Coating Machine | Hot Melt Roll Coater - Black Bros. This Black Bros. Hot Melt Adhesive Spreader is built to handle the increasing market demands for both reactive hot melt adhesive and polyurethane hot melt adhesive(RHM/PUR) applications. 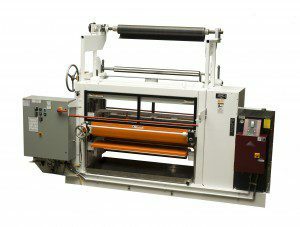 The RHM-775 Hot Melt Adhesive Spreader is equipped with the necessary features to accommodate RHM/PUR materials: rugged steel frame, drive components on one end, heat connections on the opposite end, easy access to the roll ends for maintenance, large diameter rolls with heavy duty wall thickness, easy roll change, safety glass shielding for visibility, and vent or port for vapor control/exhaust. The oil heating unit mounts on the same base as the machine and is sized to meet your needs. Standard units are available from 32″ (812 mm) through 74″ (1880 mm) capacity. Units of 74″ (1880 mm) to 128″ (3250mm) can be designed and manufactured to customer specifications based on the C-1175 model. * Bulk melt or drum unloader units are also available. We can also make arrangements to connect the hot melt adhesive supply with our liquid level to provide an uninterrupted supply of hot melt adhesive. Why Change to a Hot Melt Adhesive? – A PUR hot melt is the most versatile adhesive manufactured today. – PUR’s can be formulated for virtually any substrate and laminate. – PUR’s work well with dissimilar substrates/laminates. – There are extremely high green strengths (initial bond) in the laminated product. – Panels can be processed further without long staging times – vs – the cure time of other adhesives. – There are typically no volatile ingredients in the formulation of PUR’s – No VOC’s. – The amount of adhesive you spread at application will be the same amount present after curing. – PUR adhesive offers an exterior grade glue line, resistant to water and temperature changes. – Easy clean-up, easier than you might think.